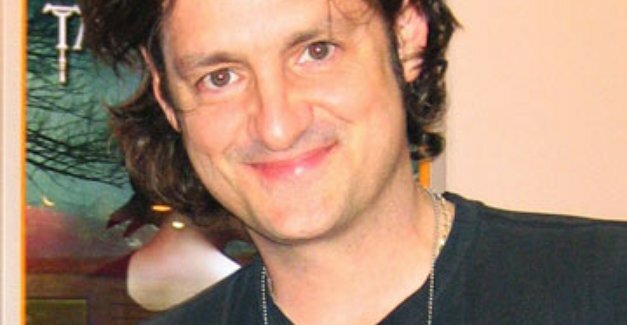 Happy 52nd Birthday, Jeff Smith! Jeff Smith is best known for his work on the creator-owned series Bone, which combines elements of cartoon humor and stirring fantasy adventures. Starting in 1991 he published this black and white comic book series' through the company Cartoon Books. The series ran 55 issues and became increasingly popular and collected in various compilations. It is now available in vibrant color collections through Scholastic. Bone has also been translated into numerous languages and published internationally. After Bone, Smith created the Shazam! The Monster Society of Evil series for DC Comics. Here he put his own spin on the story of Captain Marvel in his efforts to fight aliens and the evil Dr. Sivana. In recent years, he has returned to self publishing with the series RASL, a series that follows the exploits of an art thief who has the ability to cross dimensions. Jeff Smith has received many accolades for his work. In addition to the 1o(!) Harvey Awards and the 10(!) Eisner Awards he has already won, he has also won the National Cartoonists Society award for Best Comic, as well as France's Angoulême Alph-Art award for Best Foreign Book, and Sweden's Adamson Award. Smith cites his influences laying in comic strip creators like Charles Schultz (who did Peanuts) and Walt Kelly (who did Pogo) who crafted excellent, affecting stories as writers and artists. More about his life and career can be found in this interview with Tom Spurgeon. Also there is another great interview with him at The Onion A.V. Club. 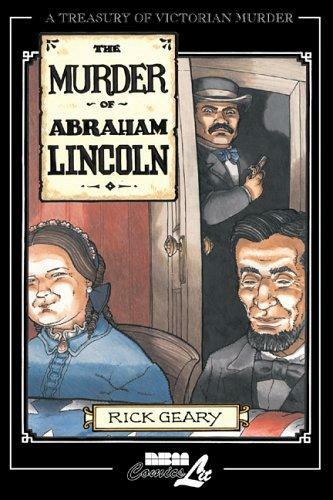 Another entry in the Treasury of Victorian Murder series, The Murder of Abraham Lincoln details a 62 day period in US history, from March 4 to May 4, 1865. In that time, famed actor John Wilkes Booth would take part in a last gasp Confederate plot to kidnap the US president and turn the tide of the US Civil War. Because of circumstances, this plan changed quickly and he and his co-conspirators embarked on one of the most infamous assassinations ever. As with other books in this series, a meticulous sense of detail exists, from the maps of Washington DC, Wilkes' escape route, and Lincoln's funeral procession to quotations from major figures to the depictions of personality quirks. In particular, Mary Todd Lincoln's histrionics are not to be missed. Rick Geary once again proves his artistic and story-telling chops in this volume. He packs an amazing number of historical references into this beautifully rendered tale while also making it compelling and suspenseful, even to readers familiar with the facts. This Inkpot Award and Book and Magazine Illustration Award winning creator is at the top of his game here. The Murder of Abraham Lincoln has been a well received book. Mark S. wrote that the black and white illustrations perfectly suited the story in this "suspenseful, entertaining narrative." Elizabeth Kiem found that Geary "has done a fine job in turning out these villainous portraits." Nate Stearns praises the book and only find a slight fault concerning its mythologizing of Lincoln. If you scroll down this page, there are a number of other positive blurbs from prestigious publications like Publishers Weekly and the School Library Journal. A preview is available from the book's publisher NBM. Happy 66th Birthday, Rick Geary! Rick Geary has been making comics for decades now. He got his start in the business with works published in high profile magazines like Heavy Metal and National Lampoon. His early work was typically whimsical science fiction, but later he branched off into more historical topics. 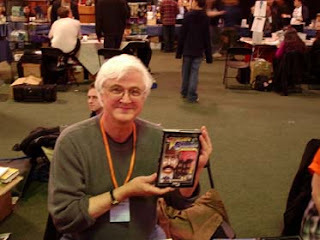 He did a few adaptations for the 1980s iteration of Classics Illustrated, Charles Dickens' Great Expectations , Emily Bronte's Wuthering Heights, and H.G. Wells' Invisible Man, which have more recently been re-released in affordable hardcover. His major project has been multiple volumes in the series Treasury of Victorian Murder and Treasury of XXth Century Murder from NBM Publishers. In these books, he presents meticulously researched and excellently rendered accounts of some of history's most famous and infamous events, including the Lizzie Borden murder trial, Jack the Ripper's killing spree, President Lincoln's Assassination, and the kidnapping of the Lindbergh baby. In addition to those ghoulish delights Geary has also created graphic biographies, like those of J. Edgar Hoover and Leon Trotsky, and branched off into historical fiction with his Adventures of Blanche books. His distinctive black and white art calls to mind Charles Addams and Edward Gorey while displaying its own qualities. This interview at Robot 6 speaks to much of his career and work on true crime and historical biography books. Although Geary might not be a household name yet, he has had a long and distinguished career. He received the 1980 Inkpot Award from the San Diego Comic Convention and the 1994 Book and Magazine Illustration Award from the National Cartoonists Society. 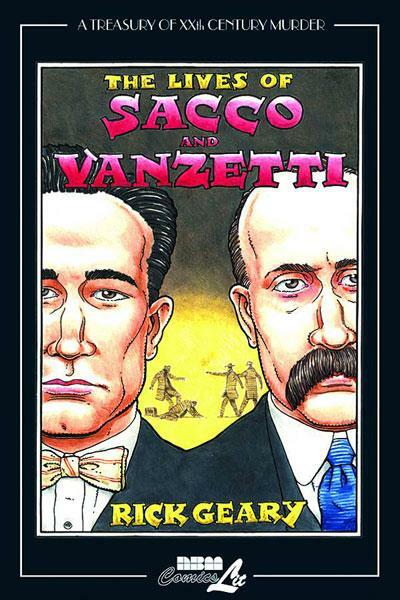 His most recent book, The Lives of Sacco and Vanzetti, was recognized as one of YALSA's Great Graphic Novels of 2012. Science graphic novelist extraordinaire Jay Holser has a new short comic in process about how the basics of ATP work. He also has another completed comic about how photosynthesis works. These comics are fun, informative, and vetted by expert scientists. Check them out! With Friends with Boys, Faith Erin Hicks paints a very human, relatable, and moving picture of a girl in transition. Maggie has been home-schooled her whole life, but now she is about to enter public high school, and she feels like her life is being turned upside-down. Her mom, her only teacher, has left. Her three older brothers, her only friends, are growing up and becoming distant. Her dad has become the chief of police and has to change how he looks and acts because of his new role. To add to everything, Maggie is also seeing a ghost who follows her around more and more. Hicks is a long publishing web cartoonist who is known for smart, idiosyncratic series like The Adventures of Superhero Girl and Demonology 101. She has also worked on a number of graphic novels including Brain Camp and The War at Ellsmere. She has won multiple Web Cartoonists' Choice Awards as well as a 2008 Joe Shuster Award for Best Creator (English Language) for her graphic novel Zombies Calling. 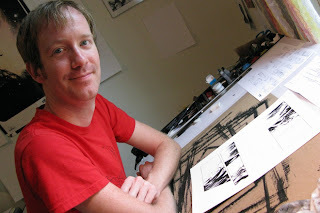 Hicks talks more about the business side of creating graphic novels in this article. Thus far this book has been extremely well received, with many expressing enthusiasm to see Hicks' latest work. Reading Rants wrote that "this insightful, smart" graphic novel "does a great job of not only telling the real deal about high school but also sensitively exploring the interesting dynamics of sibling relationships and how brothers and sisters can be your best friends—if you let them." Librarian assistant director Tasha Saecker commented that this book uses the graphic novel format well and that "the story takes several surprising twists, which makes it all the more readable." The tough critics at Kirkus Reviews awarded it a starred review. Also, for those who like to listen to their reviews, here is 3 Chicks Review Comics podcast. I know it is early in the year, but I would be shocked if this graphic novel did not appear on any year-end "best of" lists. I was taken by how well executed and emotionally charged it was. Hicks is expert at creating small but powerful moments in very subtle ways. This edition is published by First Second, and they provide a preview, discussion guide, and more here. 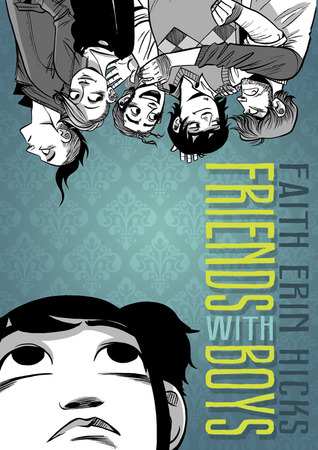 Friends with Boys is also published as a webcomic. I Kill Giants and Anya's Ghost win awards! Joe Kelly and J.M. 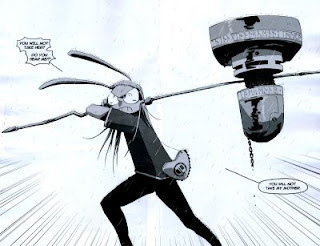 Ken Niimura's I Kill Giants, one of my favorite graphic novels published in the past few years, has won the prestigious International Manga Award. 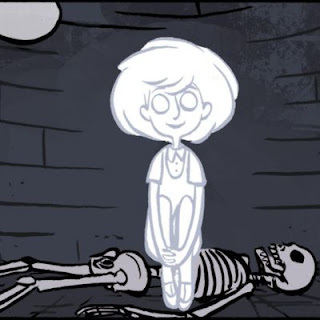 In other award news, Anya's Ghost, a surprisingly spooky and suspenseful read also won a Cybils Award for Best YA Graphic Novel. It is great to see these excellent books get such an honor. Art Spiegelman's Maus is a landmark book in the world of graphic novels. It won a special Pulitzer Prize in 1992, is frequently taught in schools, and is one of the books people point to when explaining that comics have "grown up" and are worthy of serious consideration. The weight of this accomplishment left Spiegelman with little energy to work on other comix (that's the term he likes) projects, and it was not until twelve years later and the trauma of the 9/11 attacks that he set to creating another comix narrative. In the Shadow of No Towers is the fruit of this labor. 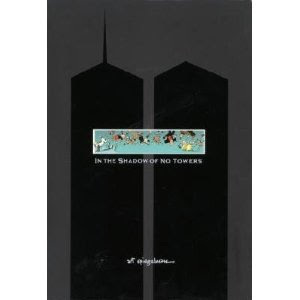 A unique narrative comprised of broadsheet sized pages that recall the classic newspaper comics of the late 19th and early 20th century, this graphic novel contains frenetic images, bold colors, and nonlinear storytelling to capture what Spiegelman felt in the aftermath of the World Trade Center tragedies. His fear for his daughter's life as he and his wife streak to her school to retrieve her, his stressful attempts to make sense of what happened, and his frustration that the US government was hijacked by conservative radicals in the years following the attacks are some of the emotions that come to the fore. Spiegelman spoke about creating this book in this interview with NPR. After the narrative, a short essay about classic newspaper strips is included as well as a handful of representative pages from series such as Bringing Up Father, Little Nemo in Slumberland, and Hogan's Alley. Looking at these, the reader sees that issues of urban blight, fear of immigrants, and concerns about high rise buildings and safety are nothing new. Reviews I have read all praise this book for its complicated and unique take on 9/11. The New York Times' David Hadju commented positively on how Spiegelman uses nostalgia to make sense of incomprehensible events and create "an approach that is simultaneously contemporary and antique." Salon's Scott Hill gushed that this book is "dark, troubling, and sometimes hilarious" and that it "may be the finest and most personal work of art to emerge from the tragedy." Liz Miller wrote that the book "feels incomplete" but that it reveals "a sad truth: in a reality-based community, little conclusion is possible." Tim Grierson added "Spiegelman's diary of witty, churning comics reenergized a great artist who has the misfortune of turning great tragedies into profound work. We should be thankful we're not great artists." In a review written a little more recently, Niranjana Iyer highlighted the political dissent this book embodies. Some preview images are available from the books publisher Pantheon. Happy 64th Birthday, Art Spiegelman! If you have ever heard of Art Spiegelman, it is likely due to his creating Maus. He won a special Pulitzer Prize for that series in 1992, and the collected graphic novel version is considered one of the great books of the 20th century in any genre or format. This dual narrative of a son trying to get along his father and his father's tale of surviving the Holocaust has touched millions of readers and been translated into 20 languages. He speaks about the impact of Maus in this recent interview with Chris Mautner. That account is a tremendous presence in the world of graphic novels, and it took Spiegelman more than a decade to draw another comix work. But even without Maus, Spiegelman would be notable in the world of comics for a number of his contributions. Coming up from the underground comix scene of the late 1960s/early 1970s, he and fellow artist Bill Griffith created Arcade, an anthology series that highlighted artists such as R. Crumb, S. Clay Wilson, Jay Lynch, and Justin Green. In the 1980s he and his wife Françoise Mouly published the seminal series RAW, which is where he first serialized Maus. RAW was an influential series as it was a prominent place for alternative cartoonists to publish their work. Later luminaries, such as Chris Ware and Charles Burns, had their early work appear there. Additionally, masterful European artists like Joost Swarte and Jacques Tardi were introduced to US audiences. In addition to his comix work, Spiegelman also worked for Topps. While there for 20 years, he created or worked on novelties such as Garbage Candy, Wacky Packages, and Garbage Pail Kids. Because of a dispute of creators' rights and the lack of royalties for some hugely successful properties, Spiegelman eventually left the company. 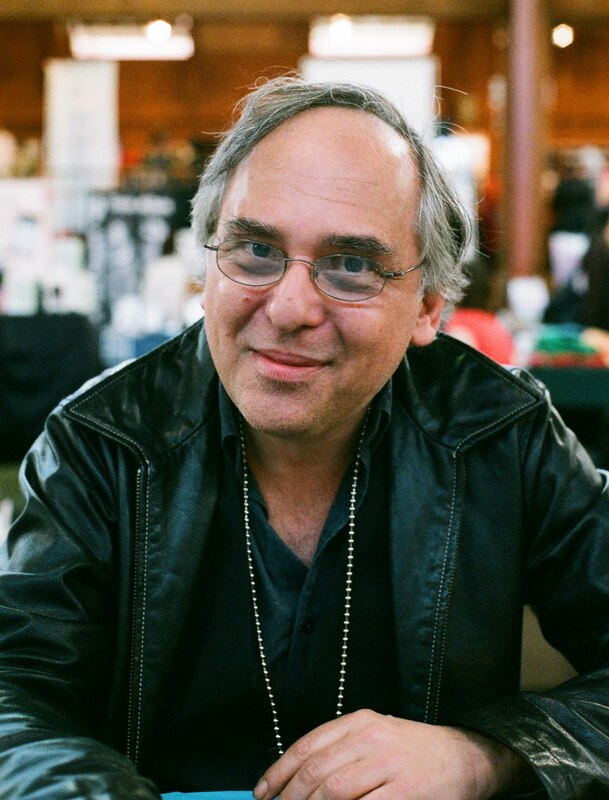 In more recent decades, Spiegelman has been an instructor and lecturer about comics history and design, a cover artist for the New Yorker magazine, as well as a huge contributor to Toon Books, a publishing imprint that focuses on graphic novels for younger readers. Spiegelman has won multiple award for his work over his career, including the Angoulême International Comics Festival Grand Prix, the Eisner Award, the Harvey Award, and the Inkpot Award. 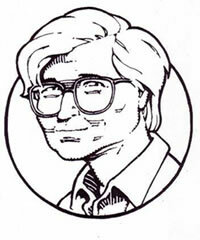 He was inducted into the Eisner Award Hall of Fame in 1999. During the 20th century, there were numerous cases dubbed the "trial of the century" but one that had international repercussions was the one involving Nicolo Sacco and Bartolomeo Vanzetti. These Italian immigrants were accused of murdering two men in 1920 in South Braintree, Massachusetts. Because of a strong anti-immigrant sentiment at the time, the two anarchists were quickly tried and found guilty, despite potential judicial prejudice, witness tampering, and mishandling of evidence. The duo ran out of appeals and were executed by electric chair in 1927. This verdict and outcome was seen as a travesty by many and inspired protests, boycotts, and riots in the US and abroad. Inkpot Award recipient Rick Geary does his typical ace job of packing the facts of the case into a compelling narrative. Notably, he also does a great job of capturing the voices of the two defendants and Judge Webster Thayer, who presided over the trial and its many appeals. His meticulous art injects a sense of drama and intrigue into the proceedings. More about his work on this book can be found in this CBR article and this interview on the NBM Blog. 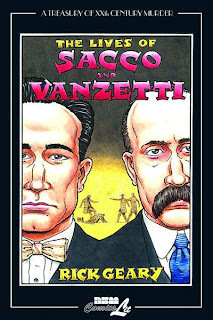 The Lives of Sacco and Vanzetti was one of 2011's best reviewed graphic novels, appearing on numerous Best of lists. Bill Sherman wrote that Geary "does his usual superb job laying out both the facts of the case and the distinct world in which it all occurs" but remarked that he did not fully flesh out defense attorney Fred H. Moore. Jared Gardner was impressed by how Geary presented the story in a balanced manner "to remind us that while two innocent men may well have been executed that day in 1927, the case against them was not as thin as the history of the Left would have it." John Seven gushed that this book showed that "Geary is the foremost practitioner of graphic novel non-fiction" and remarked that the book created a lingering feeling that lasted long after the final page. There is an in-depth interview with Nate Powell about this recent graphic novel publication at Comic Book Resources. Check it out! A story of two brothers, Ghost Stories is a sad, beautiful book about regret, family, and lost connections. This second book in the Essex County Trilogy focuses on Lou Lebeuf, an elderly, deaf man who lives in the farmhouse where he grew up. The story flashes from the present to the past, with glimpses into Lou's career as a street car driver as well as the time he and his younger but very much bigger brother Vince played professional hockey. While they are away in the big city, Lou falls in love with Vince's fiancee, Beth, and what transpires afterward changes their relationship forever . This graphic novel is the work of Jeff Lemire, a multiple award winning comics creator. He won a Xeric Award for his debut book Lost Dogs. He has also won a Young Adult Library Services Association Alex Award, a Joe Shuster Canadian Comic Book Creator Award for Outstanding Cartoonist, and the Doug Wright Award for Best Emerging Talent. 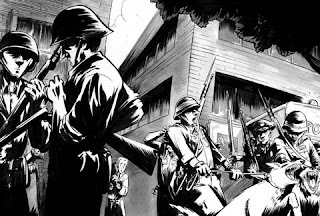 Lemire talks more about his work on the Essex County Trilogy in this interview. Reviews of Ghost Stories have been relatively positive, with most comments focusing on the powerful story and evocative art. Benjamin Jacob Hollars commented that "Lemire’s sparse and seemingly unforgiving Canadian landscape only intensifies the cool shivers that the reader finds throughout each page." Brian Heater admitted that the book is driven by melancholy but called the storytelling "so powerful" that it is very affecting. Andrew Wheeler offered a different take on this graphic novel, concluding that "I can’t quite recommend Ghost Stories: it’s technically excellent, and has a real emotional power, but its relentless dreariness turns into something almost like a parody of soap opera by the end." A preview is available from the book's publisher Top Shelf. 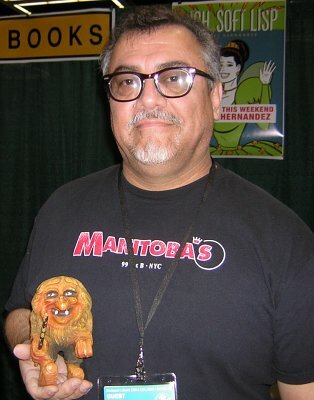 Happy 55th Birthday, Gilbert Hernandez! Gilbert Hernandez, or Beto as he signs his work, is one of the pioneering Hernandez brothers who have created the independent comics series Love and Rockets since 1982. Their landmark series (which inspired the name of the band) has been the standard for alternative comics in the US. The series contains a number of different narratives and genres, from realistic stories about Latinos and rock bands to sci-fi tales of space aliens, professional wrestlers, and mechanics. Beto's stories are typically marked by a type of magical realism where fantasy and reality become indistinct. Many of his tales are set in the fictional locale of Palomar, a small Latin America town, and feature strong female protagonists. His most famous character is probably Luba, whom he follows from her childhood in Palomar to her dealings with gangsters and her relocation to the US. Beto also has a focus on Luba's half-sister Fritz, who stars in multiple B movies. Many of his self-contained graphic novels, such as Chance in Hell and Love From the Shadows, are adaptations of the fictional movies she appears in. In addition, Beto's love for low budget movies comes out in his project The Naked Cosmos, an eccentric television program about a strange prophet named Quintas. One of comics most highly regarded creators, Beto has won multiple awards for his work over his career, including the InkPot Award in 1986, the Kirby Award in 1985, multiple Harvey Awards, and a 2009 Fellow Award from United States Artists. Love and Rockets has gone through a few format changes over the years, and now is published as an annual volume. In addition to these volumes, Beto also publishes the occasional graphic novel such as Sloth. A list of Hernandez's works is available at Fantagraphics Books (warning: some images are NSFW).